As we conclude our spring tulip display, please note that some garden areas are currently in transition as we prepare for summer plantings. 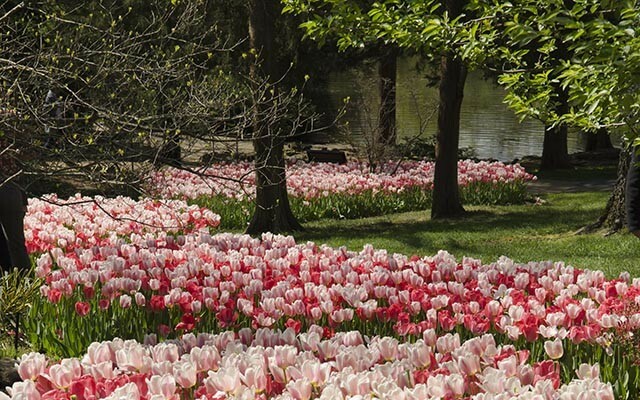 The Howe Garden is one of the most beloved gardens at Cheekwood. Thanks to a renovation from The Garden Club of Nashville, visitors today can see the original Wildings garden, a state-of-the-art rain garden, Mrs. Howe’s Thatched Toolhouse and an endangered stinking cedar (Torreya taxifoia). Celebrating the remarkable life of Sigourney Cheek, the Literary Garden offer Cheekwood’s guests a place to seek solace and inspiration with gorgeous views of the Tennessee hills. 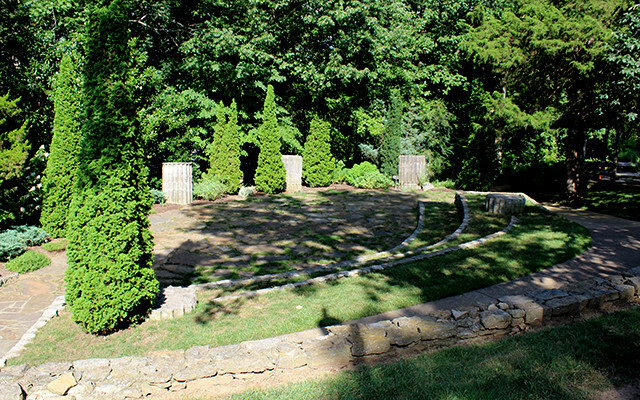 The amphitheater setting was specially designed to host poetry and book readings for small groups. The Cheek home and its gardens were designed by Bryant Fleming in the late 1920’s. The elegant Georgian-style mansion is surrounded by lawns and terraced gardens with extensive plantings of boxwood. From Ford Wisteria Arbor, overlook the formal plantings and a reflecting pool with statues of Thalia and Urania. There are broad views of the nearby hills, spectacular in the fall. Visitors to these gardens find themselves transported to another time and place. 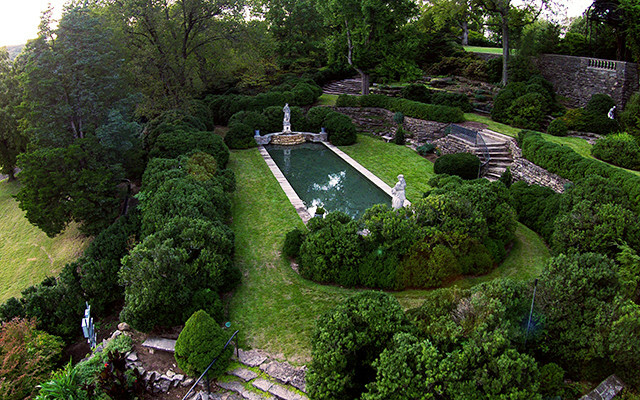 These original Cheek gardens include a wooded stream, pools, fountains, and a stone grotto. The water features were important to the design and harmony of the setting. An allée of crape myrtles leads into this garden where sweeping curves of colorful flowers border a sloping lawn and give a view of the distant hills. The beds are planted in annuals, perennials, and tropical plants. The color comes from both the profusion of flowers and from colorful foliage. Follow the path to eight curved arches covered with flowering vines. At the end of the walkway, there is a giant urn planted in the same dramatic style. This garden reflects the universal love of color as a design element. 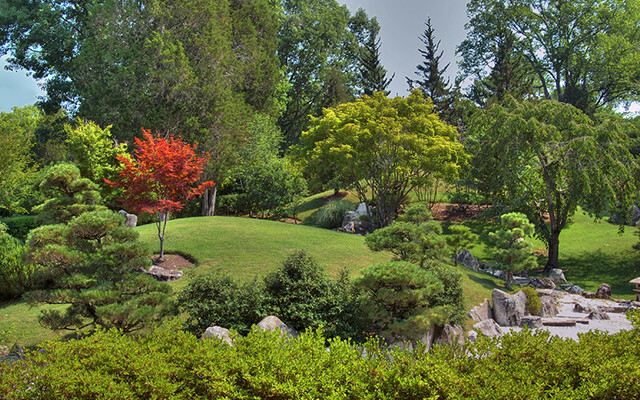 Dedicated in 1982, this garden displays many selections of Cornus species planted under oaks and pines, and is the centerpiece of our Nationally Certified Collection® of Cornus. 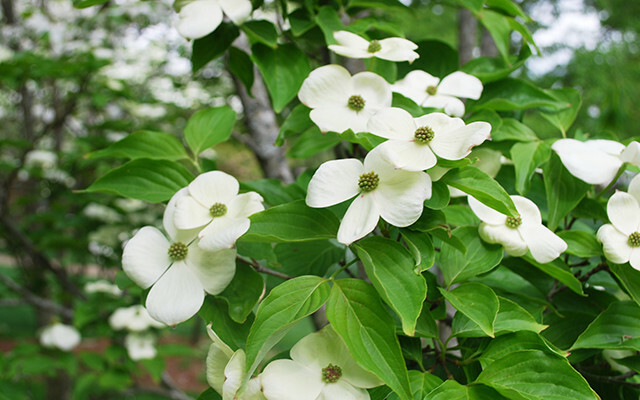 The garden displays many variations in branching patterns, bark, leaf, berry and the showy bracts characteristic of dogwoods. In the fall, burgundy foliage colors the garden in addition to our Tennessee hills. Hostas, astilbes, native ginger, daffodil, ferns, hydrangeas, and hellebores are planted at ground level. The herbs are our link to the past. On every continent there is folklore of plants and their uses. This garden, installed in 1983, displays herbal plants that can be grown in Middle Tennessee. There are plants to touch and smell, to use for cooking, fragrance, dyes, fibers, and cosmetics. There are culinary herbs whose leaves, flowers, or seeds are used in flavoring and decorating food. There are also herbs for other household purposes. Shōmu-en, the Pine-Mist garden, is a place of quiet and meditation, a refuge from the outside world. The lantern at the gate is a symbol of enlightenment, and the gate always stands open as a sign of welcome. The garden is in four parts. The roji, or crooked path, slows your progress and invites observation. Then you pass another gate into the dark bamboo forest, intended to turn the mind inward. A third gate takes you into a grassy courtyard with gingkos, maples, and a carved basin where water falls from a bamboo pipe into a rock basin. Ascending the wide steps and entering the pavilion, a great body of water, symbolized by raked gravel, comes into view. It contains granite islands and is surrounded by stunted pines seen on a distant shore. A stream comes down the mountainside and graceful maples complete the peaceful scene. Rest here and let your mind travel through this island of tranquility. 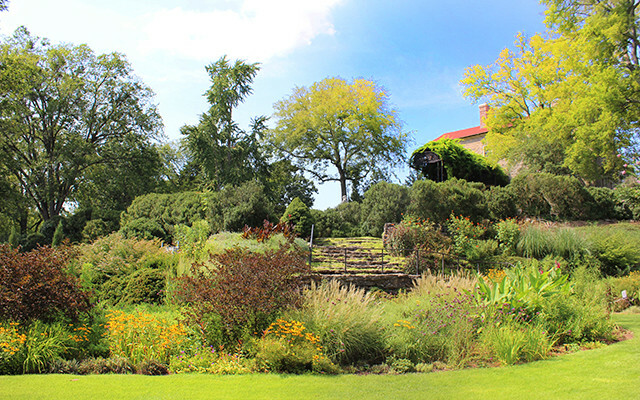 Below the formal gardens of the mansion, overlooking the mustard meadow and the ponds of the Robinson Family Water Garden is the Wills Perennial Garden. It is dedicated to iris breeder and author, Jesse Wills and displays both new and traditional perennials and many bearded iris. A steep limestone wall provides both habitat and background for this colorful, full-sun garden. 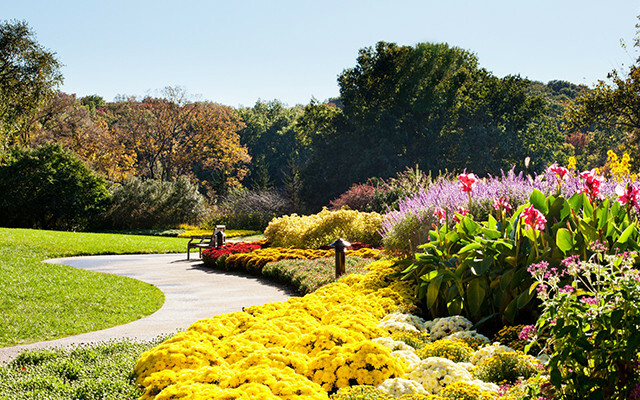 The Wills Perennial Garden reaches its peak in the summer when the succession of color culminates with asters, salvias, perennial sunflowers, rudbeckias, and ornamental grasses. 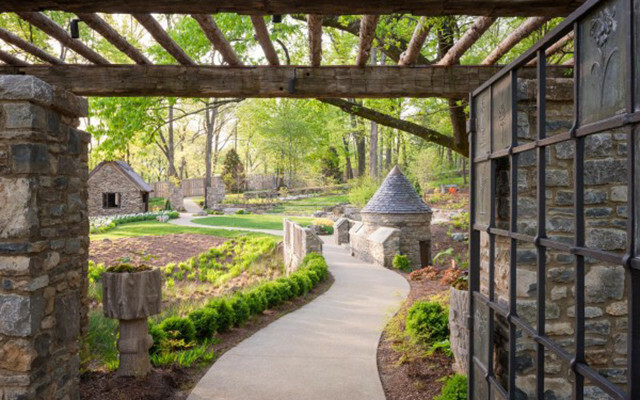 The Turner Seasons Garden focuses on the seasonal aspect of gardens in Tennessee. It features a series of garden rooms, each with a decorative rain basin and plant collections of special interest. The rain basins, enhanced with poetry relating to the season, remind us the gardens are both art and science. 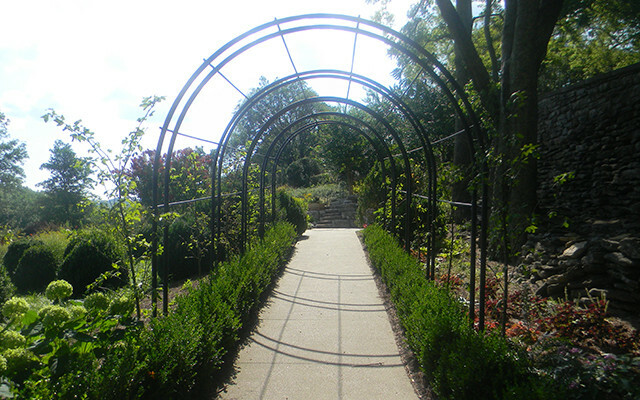 A decorative arbor, covered with old fashioned roses and bordered by the Hardison Daffodil Collection in spring, is found at the top of the garden. The seasonal rooms cascade down the hill finishing with the summer garden which contains the Peck Daylily Collection. Visitors walk among flowering trees and shrubs and may study and compare favorite groups of plants. Plants providing fall color, winter berries, and bark patterns will be found in the garden for all seasons. Installed in 1972, this garden is reminiscent of a garden in Padua, Italy, dating back to 1542, considered to be the oldest surviving botanical garden in the world. 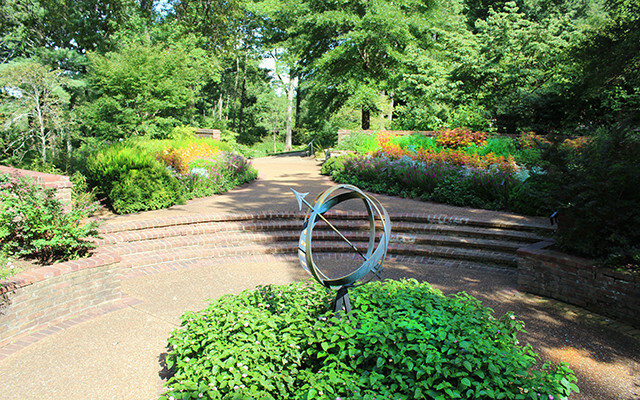 The Burr Garden is an enclosed garden on three levels with colorful annual plantings, an armillary bed, and a fountain. The flowering season begins in early spring with blooming bulbs and contrasting violas. Summer presents a sea of color with summer phlox, purple coneflower, and vibrant summer annuals. One of the newest gardens at Cheekwood, the Rose Study Garden was opened in 2016 and is dedicated exclusively to America’s official flower – the rose. 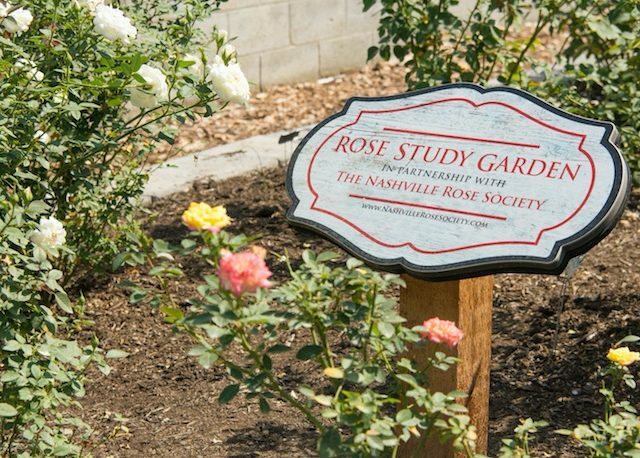 Built and maintained by the Nashville Rose Society, the Rose Study Garden contains over 70 roses of all types and colors, including Earth Kind (no spray) roses, hybrid teas, grandifloras, miniatures, climbers, shrubs and Old Garden roses. Its spectacular blooms can be seen from April all the way through October. 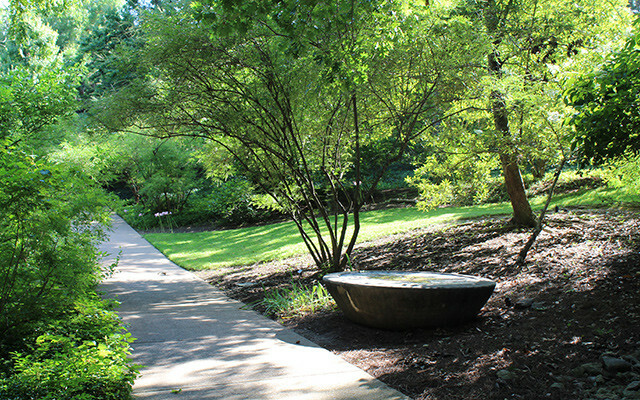 With Education being one of Cheekwood’s Core Values, the Rose Study Garden is used primarily as a teaching tool, in which the Nashville Rose Society helps Cheekwood’s members, new members of the Rose Society, as well as the general public learn how to grow beautiful roses in Middle Tennessee. The original design of the Cheek gardens included three large ponds that served as reservoirs for the many water features as well as the water supply for the house. The ponds are planted with shade loving perennials along the banks, along with seasonal annual color. The sound of cascading water is heard as you walk along a rocky stream examining the fern collection, hellebores, hostas and heucheras. The Carell Woodland Sculpture Trail is a delightful 0.9 mile walk at any time of the year. A unique combination of art and nature, it traverses several habitats. Enjoy a dry limestone based area dominated by eastern red cedar and osage orange to an oak and hickory forest. 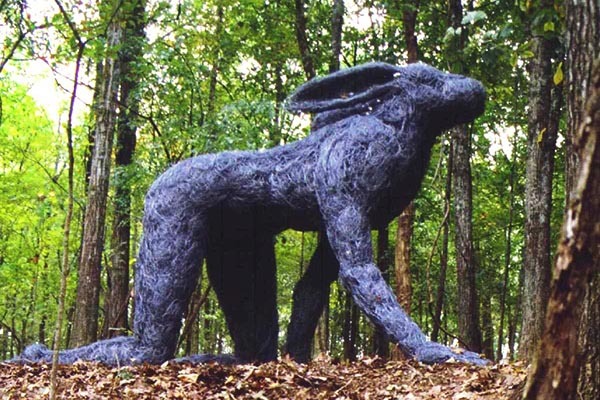 Along the way you will encounter contemporary sculptures that were designed to be placed in a woodland setting. Once overwhelmed by the invasive Japanese bush honeysuckle, the area has been reclaimed and replanted with native trees, shrubs and wildflowers. Ephemeral wildflowers, such as toothwort, spring beauty, and wild larkspur come up in the spring before the leaves have emerged on the trees. Birds, squirrels and chipmunks are seen as you walk along the shaded path under the shagbark hickory, persimmon, ash, oak and sassafras trees. Closed until 2020 for renovations. Please note: Our gardens change seasonally, and may not appear as pictured.